You know that little "ding" that your car makes to let you know your seatbelt isn't on? It's a reminder to safely buckle up or you could get injured. It's the same ding that tells you your oil needs to be changed. It's a great system for keeping your car running right. Well these dings and jingles are great because they stop after 10secs, and you're reminded to do what it says. Well my car is confused. It thinks that my brakes are going out, so it really wants me to know it. Which is good, if they were going out. But they're not. My brakes work perfectly. The car just seems to think they don't. 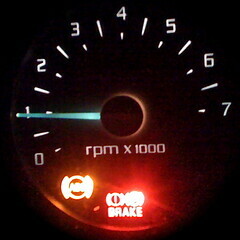 So about 10secs out of PARK, the car DING DING DING DING and the red light comes on saying the brakes are out. Well this is a bit annoying, but I ignore it, the car knows I got the point and we drive on together. Then my car's short-term memory leaves it. 30secs after the DING happens, the system goes, "hmm, everything seems fine now, I'll just shut off this light, and he can go back to… DING DING DING DING DING DING DING Hey your breaks aren't too sharp buddy! You ought to really go… uh… oh, everything's fine. What was I even dinging about? Oh well I guess WHOA DING DING DING DING! Lookout! Did you hear about your breaks?" Yes. Yes it is a joy. It's actually really funny. About every 40secs the DING DING happens for about 10secs. So, 10secs of DING, 30secs of rest, 10secs of DING… repeat. I think it's hilarious. Or at least I did. But in the past few weeks it's been doing this I've driven the 4hr drive to home 3 times, plus 3 little 1hr Little Rock trips. That's 30hrs of DING DING DING. Aubrey was along for one of the trips home and one of the Little Rock trips. She said it was only a matter of time until I went completely insane. This DINGING DING is kind of wild and most likely will slowly put me away. However, I have chose to not let it bother me or bring me down. I have stayed positive to my passengers through mumbling "Serenity Now" to myself under my breath. It'll all go away soon, and why wait? I can have serenity now! I feel perfectly fine about the entire situation. The car goes to the dealership at 8am.